Lucky for me the Tuesday Trigger challenge at Moxie Fab World is a three-weeker this time 'round. I intend to play most weeks at MFW, but with life keeping me busy, sometimes I can't get a good idea (and the time to make it materialize) in just a week. I thought and thought and thought about what to do with it. I do not have house stamps, so had to get more creative. 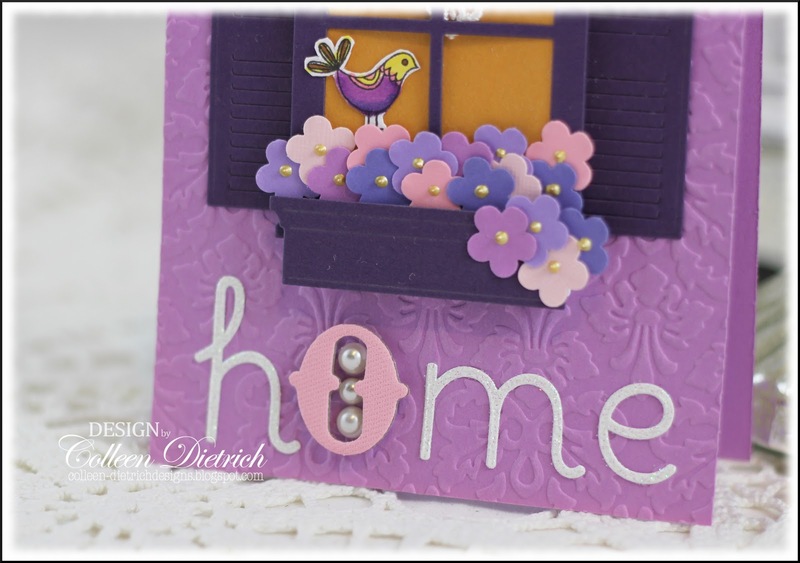 When I saw a new slew of challenges at MFW, namely the Paper Crafting Tips & Tricks Week: The Alphabet Stickers Challenge, the idea hit me to use a window die. The idea was somewhat simpler in my head, but when I put it on paper, it looked too plain. I embossed, I added a lace curtain, I added an overflowing window box of flowers, I placed a bird atop the blossoms. After the hectic week I've had, it's good to be home, and make a card. 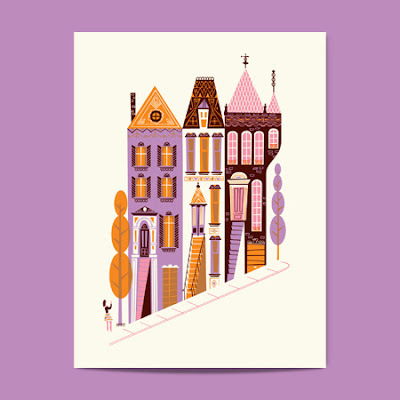 I LOVE the way you've taken a single window from the houses as your inspiration Colleen! And it's dressed up so pretty. I used to drive by a house this exact shade of purple every morning on my way to work. You could see it coming from a LONG way off!!! This window looks like it belongs o a Victoria house - love the overflowing window box, embossed background and the pearls in the "o" is a fabulous detail! Absolutely adorable! You must win with this one!!!! OMYGOSH!!! I am IN LOVE!!!!!! I love love love love love the bird, the lace trim, the flowers and loveeeeeeeeee the pearls!! GORGEOUS!!!!!!! It is good to be home sometimes and this is a beauty to come home to! Love that little bird. Oh, this is so sweet! 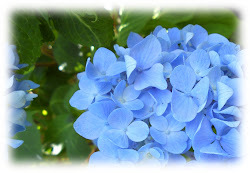 i love the pretty flowers...beautiful card! GREAT take on the trigger!! LOVE the flower box and lace curtains. Gorgeous~ I want to find time to make a card too, but no such luck. Are you bracing for the "storm"? What fun huh! Is it almost November or what? Apparently Mother Nature didn't get the Memo. Again, this is fantastic and you are spot on the trigger! 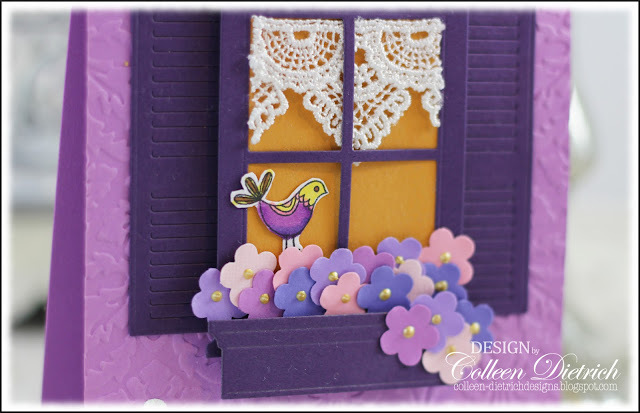 Absolutely gorgeous card ...love the window and the way you have created the whole scene...just fantastic!!! So beautiful! A great interpretation of the trigger! OMG Colleen. This card is fantastic! 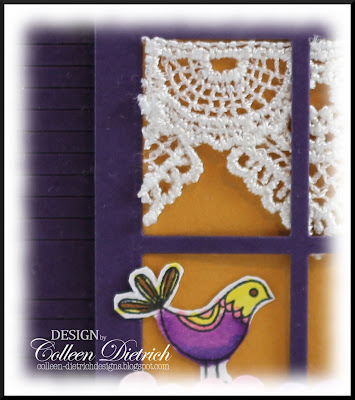 I love the lace in the window and the colors you used! I don't have the flower box die but might have to consider getting it. I love the way it looks with those adorable flowers! Just beautiful!!!! Isn't this just too cute. I love the lace in the window for the curtain and the flower box full of pretty little flowers. It almost looks like my window...lol Just darling. Wow!!! Absolutely adorable and gorgeous!!! The pretty embossing, the window with lace, tiny flower, and little bird...love it! This card is truly one of my favs! Great job, Colleen! How fun! So many great elements! Gotta love the lace curtain! Almost like Pella with the lace and the house colors. This card is SO PRETTY!! I love it! It looks like a winner to meI I was going to do this challenge, but I'm running out of time! Thanks for reminding me! Darling window box and you know I love the bird. Just a sweet, sweet card and soooo pretty. Wow! Wow! Wow! Your take on this challenge is awesome! Love the flowers cascading down the flower box! The whole card sings LOVE!~! Love those flowers, the colors, and what you did with the O!!! WOOOOOOOOOWZA! LOVE this--love the flowers!! LOVE the lace curtain!! LOVE that little birdie--LOVE it all, COL! 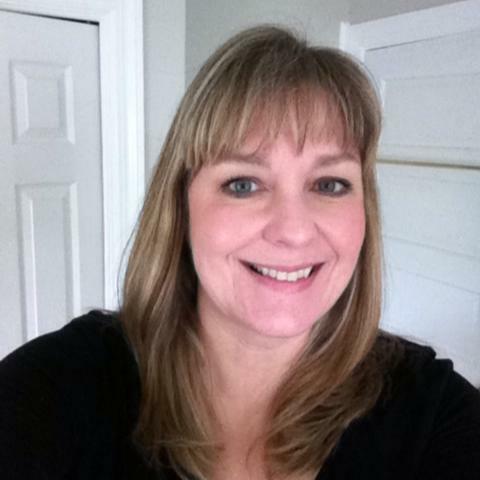 BEAUTIFUL, BEAUTIFUL work Colleen! Gorgeous window scene! This is BEAUTIFUL and such a unique take on the trigger!!! Oh, this is BRILLIANT, Colleen! I'm sure you had fun with all the purples on this, and your ABC sticker sentiment looks whimsical and fun, just like the inspiration photo. I LOVE your lacy valance at the window. This looks like a winner to me!! Amazing choice of colors - love the yellow on the birdie. And that cascade of flowers - wonderful! How cute. You house looks warm and welcoming with the little flower box filled with flowers. That is a wonderful eye catching element.